15 million job searches were conducted over the past year. Trying to find a job on the web is like trying to find a needle in a haystack. With so many job sites to wade through and keep track of, the process of searching for a job can be overwhelming to even the most savvy computer user. Jobview is a self-service employment application that simplifies the job search process by allowing users to find daily updated local, regional and national jobs from a simple user interface that is purpose-built for one task—search and apply for jobs! Turnkey, Self-Service Kiosks: Jobview kiosks operate like an ATM for Jobs. Thousands of jobs can be browsed using an intuitive, touchscreen interface. Users can get a hardcopy of job descriptions from the built-in printer, or they can email or text message job descriptions to themselves directly from the kiosk. On selected versions of the kiosk, the user can apply on-line to any job using only their finger. Jobview kiosks are typically located in high-traffic public locations to allow more job-seekers to be served in less time than any other job search method, and to extend the reach of job service providers with no increase in staff or facility costs. Software Desktop Application: The Jobview service can also be accessed from any desktop computer using a link provided by Jobview. Local, regional and national jobs can be browsed from the same simple and intuitive user interface. Jobview eliminates the time consuming and confusing process of finding and searching through multiple job sites. Web Access: The Jobview service can be licensed to operate via a link from an existing website. All of the Jobview services including jobseeker tracking are available through this service. Jobview Corrections services are used by correctional facilities, probation offices, halfway houses and other reentry locations to allow individuals returning to the community to search for current jobs, from secure or non-secure locations. The secure version of Jobview functions without having access to a keyboard or the internet. The Jobview user interface is intuitive so no training is required, even for those who have never used a computer. Jobview gives reentry users a 30-60 day head start on finding a job. Jobview Public Service In addition to the kiosk version, the Jobview service can be installed on all workstations in a public service facility to make it fast and easy for job-seekers to search and apply for jobs. Jobview allows these facilities to provide a valuable service to patrons during these difficult economic times. The Jobview service integrates many job databases which can be combined with any state jobs database. In addition to libraries the Jobview services are installed Workforce Centers, Community Colleges, Urban League Centers, and other public locations. Because the service is completely self-service it can be placed in extended locations with no staffing or facility costs. Since 1995 Jobview has been designing, implementing and maintaining interactive touch screen employment kiosks to present users with an ATM-like experience when searching for a job. Similar in concept to an ATM, the Jobview kiosk is an automated employment machine that allows users to view, print, email, text and apply to jobs—all at the touch of a finger. Unlike traditional web-based job sites, Jobview does not allow the user to wander around the internet. 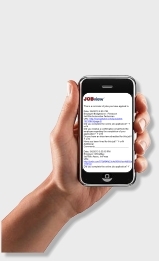 Jobview maintains control over the entire job search experience. Because Jobview is focused on the job-search-and-apply function, each kiosk or software desktop version can support thousands of job searches per month. In fact, in high traffic locations a single Jobview station can support over 15,000 job searches per month—completely self-service. Jobview stations are leased by Libraries, Correctional Facilities, Workforce Centers, Newspapers, and other public-service organizations. For the kiosk version of our product, Jobview is responsible for maintaining all aspects of each kiosk so the service provider has no staffing or facility costs to deal with when supporting a kiosk network. Jobview staff even provides a list of the best locations for kiosks to be placed. In addition, Jobview software provides a cost effective means of employing the Jobview service on existing workstation terminals. For more information on Jobview products and services please call us at 866-562-8439 or email us at jobinfo@Jobview.com.